The Potomac River is one of the Chesapeake’s primary tributaries and it runs right by our nation’s capital. The river plays an important roll in history and our images of DC. The Tidal Basin that you see in photos of the Jefferson Memorial and other DC monuments is a reservoir between the river and the Washington Channel. Boaters can cruise up the Potomac and stay at one of DC’s marinas. 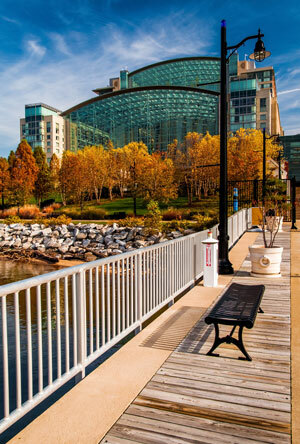 The newly-developed National Harbor area offeres a mix of marinas, dining, shopping, and entertainment. There is so much for a visitor to see and do in Washington that it’s hard to know where to start. Everyone should visit the National Mall and Memorial Parks. And the Smithsonian Museums have something for everyone. You can order a visitor’s guide from Destination DC. DCvisitor.com has information for visitors, including hotels, transportation, tours, entertainment, and free things to do. The Hay-Adams – Luxury historic hotel in downtown DC. Near the Whitehouse and Lafayette Square. Sofitel Washington DC – Located in a historic building on Lafayette Square. Palomar Washington DC – Luxury boutique hotel in Dupont Circle. Park Hyatt Washington – Luxury hotel in West End area, close to Georgetown shopping and Embassy Row. More Washington DC Hotels – Washington DC hotels organized by their proximity to sights and attractions. If you’re not arriving by boat but still want to see DC from the water, there are several cruise options available. DC Cruises. 45 minute narrated tours of the monuments via the Potomac River. Boarding every hour on the half hour. Boarding location is 3100 K Street NW, in the Georgetown neighborhood. Odyssey Cruises. Lunch, dinner, and brunch cruises. Fine cuisine and with a view of the monuments. Departs from Gangplank Marina, 6th and Water Streets, SW Washington DC. Potomac Riverboat Company. Offers a Washington Monuments cruise, Mount Vernon cruise, and Alexandria Seaport cruise. Depart from Alexandria and Georgetown. Spirit Cruises of Washington. Lunch and dinner cruises depart from 600 Water Street SW and from National Harbor. Capital Yacht Club. A private club that offers limited availability transient guest slips. The Gangplank Marina. A 309 slip marina located in the Washington Channel. Limited transient slip availability. James Creek Marina. A National Park Service facility with 297 slips ranging from 18 to 87 feet and transient dockage for boats of 100 feet +. Shore power and water, fuel dock, restrooms and showers, picnic area, easy access to public transportation. National Harbor. 64 slips and facilities that include changing area with showers, laundry, and fuel dock. Washington Marina. A full service marine facility with ship’s store and service department. Slips range from 20 – 125 feet in size. Facilities include restrooms, showers, shore electric and water, pump out, slip holder parking, and easy access to public transportation. DC Tours. Bus tours, Segway tours, bike tours, and walking tours. Official Tourism Site. Order a visitor guide and check on current events. Christmas in Washington DC. Enjoy a holiday season visit to our nation’s capital.